A great video can quickly go viral on social media; a poor one can lose an audience in seconds. Video adds a new dimension to your content, either by enhancing written content, or as a standalone with a written introduction and teaser. Here are nine ways to capture your watching audience. Grab their attention with a powerful opener. The video and the first line should be the best shot you can find, and accompanied by an equally compelling storyline. What is your video supposed to be about? What are people anticipating? If it’s a how-to, keep the introduction short and get straight to sharing the concept or big idea so that it is clear and concise. In video, it’s easier to communicate your main points if you break sentences across frames. Too many words or topics can be difficult for a viewer to comprehend and cause them to lose interest. Stat– 18 is the average number of videos published by businesses each month. Match your audio to the video. If someone isn’t listening, they should grasp a good sense of what the video may be about from merely glancing at the video. At the same time, if they’ve switched screens or walked away, they should know what’s going on by hearing the audio and background sounds. It’s okay to show a still image, but it’s even better to have the image slowly zoom or pan from one side to the other. However, don’t switch shots in the middle of zooming or panning. This makes the video appear abruptly cut-off and can be a jarring experience for the viewer. Stat– The four most common types of videos are: Explainers, Product Demos, How-Tos and Testimonials. Identify who’s talking and where. In video-speak, these are called “chyrons” and refer to the text-based graphics at the bottom third of a screen. It’s important to identify who is speaking for context. Remember to introduce people in the audio in case someone is only listening to the video. A majority of your viewers may have the volume down or off. Using captions can help viewers read along while watching, making the video accessible to all. Videos that lag or don’t have a lot of momentum will lose viewers quickly. Keep the video moving and the points brief. Your narrator should have a lot of energy when speaking as well. Remember, some of the most successful videos are thirty-second clips on social media platforms like Instagram, Snapchat or Facebook. Keep your video to about a minute or two minutes, maximum. If you can’t deliver your message within that period of time, then you need to re-think your strategy. Stat– Videos under 90 seconds see an average retention rate of 53% but videos over 30 min retain only 10%. 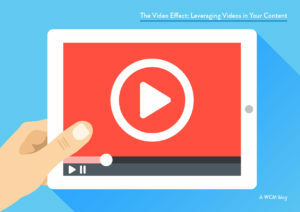 Once you’ve figured out the basics, you can start putting together some really powerful video features to enhance your content and drive traffic.